With a continuous increase of progressively older citizens, age-related healthcare is becoming a significant problem both from a humane and economical perspective. This burden on both society and individuals such as relatives would be eased if afflicted individuals could live a more independent life, in their own home, since life in an institution is significantly more costly. More importantly, many individuals have a wish to remain living at home. 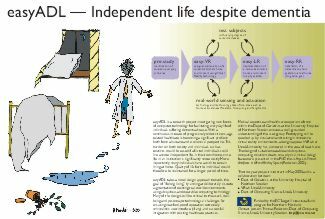 easyADL is a 20-month research project finishing in May 2007 investigating new forms of computer technology for facilitating everyday life of individuals suffering early stages of dementia disease. To develop a prototype for a “cognitive prosthesis” (Fig. 1) enabling people suffering weak dementia to perform important Activities of Daily Living (ADL) in their homes without professional support. Geriatric: To find out to what extent state-of the art computer technology could complement existing care practices. Virtual Reality: 1) To determine how well VR technology can be used to simulate sensors and sensor configurations when designing Ubiquitous Computing (UBICOMP) systems; 2) to construct a VR design studio that facilitates exploration of alternative UBICOMP user interfaces. Computing Science: 1) To identify the best possible combination of computing algorithms and wearable sensors, for automatic ADL recognition; 2) to evaluate the interaction model “egocentric interaction”. The project takes a novel design approach towards the goal of "lifelong living" by aiming at deliberately discrete augmentation of existing real-world environments using mainly wearable computing technology, in part simulated using virtual reality technology (Fig. 2). Many of the designs will be critical to the user's wellbeing and pose major technological challenges for ensuring near-fool-proof operation, extremely minimalistic user interface (if any), and successful integration with existing healthcare practices. Fig. 2: General system development plan for easyADL, and beyond. The project has resulted in the development and evaluation of a new activity recognition approach (Fig. 3) with very competitive characteristics compared to existing approaches within the area of Ubiquitous Computing, showing an activity recognition rate of 89% among 10 everyday activities in the home (Surie et al., 2007) while being performed in a simulated VR environment (Fig. 4). it is designed from scratch to require only minimal changes to the surrounding environment, a) reducing cost of deployment, b) reducing cognitive load on dementia patients who typically have big problems adapting to changes, c) allowing the cognitive prosthesis to operate (in principle) in any kind of environment, not just at home. used for activity recognition and support. The activity recognition method is based on a training phase where the patient teaches the system a set of activities for which support is needed. Using clustering algorithms such as Hidden Markov Models and Growing Neural Gas, the system creates images of correctly performed activities. In the future, if the patient would deviate too much from the "normal" way of performing the activity, the system will react by suggesting corrective actions. Fig. 4. 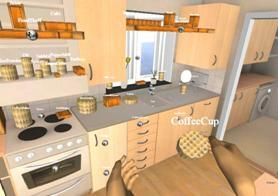 The VR environment simulating a real-world kitchen. 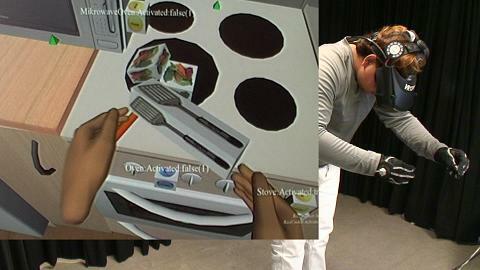 A conceptual design of the user interface towards the cognitive prosthesis has been developed (Sjöblom & Zingmark, 2007) in collaboration with experienced dementia caregivers at the Geriatric Center, University hospital of Northern Sweden, and is currently being implemented into the VR prototype. The proposed interface uses primarily the modality of spoken language on a cellular phone, complemented by a wireless headset and sensors (for activity recognition purposes) worn on the upper part of the patients body. The support system is at the time of writing able to fairly accurately remind the patient of forgotten sub-components of an activity, either automatically or on demand through the push of a button on the cellular phone. At the moment, parts of the the cognitive prosthesis software is run on a laptop PC but is expected to possible to port completely to a cellular phone platform in the very near future, as the processing power of mobile devices increase. In parallell with the development and evaluation activities performed using the VR environment, the activity of develoing a hardware prototype has also been initiated. A combination of the RFID and ZigBee standards is being used as sensing and communication platform. Dr. Thomas Pederson, project manager, Dept. of Computing Science, Umeå university. Phone: +46907866548, email: top [at] cs.umu.se. MSc. Dipak Surie, PhD student. Research areas: Ubiquitous and Wearable Computing. email: dipak [at] cs.umu.se. MSc. Fabien Lagriffoul, software developer, Artificial Intelligence specialist. email: fabien [at] cs.umu.se. MSc. Daniel Sjölie, software developer, Virtual Reality specialist. email: deepone [at] hpc2n.umu.se. MSc. Anders Backman, software developer, Virtual Reality specialist. email: andersb [at] cs.umu.se. Professor Gustaf "Gösta" Bucht, Geriatric Medicine Dept., University Hospital of Northern Sweden. Med. Dr. Björn Sondell, Geriatric Medicine Dept., University Hospital of Northern Sweden. Kenneth Bodin, manager of VRlab at Umeå university. Professor Lars-Erik Janlert, Dept. of Computing Science, Umeå university. Surie, D., Pederson, T., Lagriffoul, F., Janlert, L.-E., & Sjölie, D. (2007). Activity Recognition using an Egocentric Perspective of Everyday Objects. In Proceedings of IFIP 2007 International Conference on Ubiquitous and Intelligent Computing (UIC2007), Springer LNCS. To appear. Bhatt, R. (2007). Comparing the Performance of ADLs in “Virtual” and “Real Life” Environments. Dept. of Computing Science, Umeå university, report UMINF-06.40. Sjöblom, S., Zingmark, S. (2007). A User Interface Proposal for a Wearable Cognitive Prosthesis Supporting Dementia Patients with Activities of Daily Living. MSc thesis, Dept. of Computing Science, Umeå university, report UMNAD 679. Surie, D., Pederson, T., Lagriffoul, F., Janlert, L.-E., & Sjölie, D. (2007). 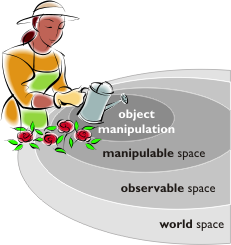 Activity Recognition using an "Egocentric" Perspective of Everyday Objects. Dept. of Computing Science, Umeå university, report UMINF-07.001.